Ever get a hankering for cheesecake but don’t want to deal with the hassle of making a whole entire cake? ME TOO! Not to mention that portion control (with full-size desserts) is difficult for me since I’m the only Keto-er in the house and my fiancé isn’t a sweets guy. AKA: I could easily finish an entire cheese cake in a few days all by myself. That’s why these mini cheesecakes are so amazing! Not only are they perfectly portioned, they’re ridiculously easy to make as well. Best of all they pack a lot of flavor punch with minimal calorie and net carb damage. At only 3 net carbs per serving, these cakes are easy to squeeze in to your day – whether you’re following the ketogenic way of eating or simply just watching your carb intake. The tricky part, however is only eating just one! If you have very little free time but love having fresh baked keto goodies around, especially pre-portioned ones, this mini cheesecake recipe is for you! Even my non-keto, stevia hating fiancé absolutely loved these! They’re THAT good! A low carb, ketogenic cheesecake dessert that is perfectly portioned and oh so delicious! Plus, they're ridiculously easy to make! Preheat oven to 350ºF. Line muffin tin with cupcake liners. In a bowl, mix softened butter, almond flour & stevia to form the crust dough. Using a spoon, add 12 equal parts of the crust mixture to the cupcake liners. Press down with spoon & make sure each crust lays flat. Bake crust for 5 minutes, or until slightly golden brown. In a large bowl use an electric mixer to blend the cream cheese until smooth. Add in eggs, lemon extract, vanilla extract & stevia. Blend until shiny & ensure there are no lumps. Pour 12 equal parts of the cream cheese batter in to the cupcake liners. Flatten any uneven areas with a spoon. Bake for 15 minutes. Once completely cooled, remove the cakes from the pan and add 4 blueberries to the top of each one. Refrigerate for a minimum of 4 hours before serving. 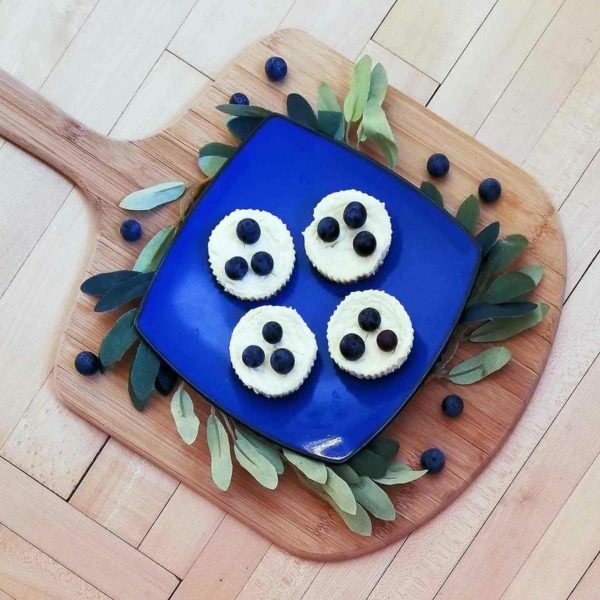 Believe me when I say there's absolutely no reason not to try these little cheesecakes! This recipe is definitely a staple in my arsenal when entertaining & meal prepping, so fast and simple - no big mess to clean up or huge cake to cut, just grab and go. You could probably even freeze the cakes and thaw them out at a later time, however I haven't tried that yet. If you do decide to make these bad boys, don't forget to come back and let me know what your thoughts are after you try them. Also, don't be afraid to ask me any questions! Disclaimer: The listed nutritional facts for this recipe are estimates provided by MyFitnessPal. Product availability and food preparation may cause differences in nutritional values. I am not a health care professional. Nothing stated in this post should be used in lieu of professional medical advice. Please see your Physician or Dietitian with any ingredient concerns.